Customers who purchase either the starter edition or the complete edition will be granted a 30-day free play period. If you wish to continue playing after this period, you must subscribe to the game. * Registration of this product also grants users access to FINAL FANTASY XIV: Heavensward. See below for details. 〇 〇 〇 * The collector's edition also includes in-game bonus items. - 〇 〇 * The collector's edition also includes in-game bonus items. * The collector's edition also includes in-game bonus items. * FINAL FANTASY XIV: Stormblood does not come with a 30-day free play period. * All subscription fees are subject to change in accordance with the terms of the FINAL FANTASY XIV User Agreement. FINAL FANTASY XIV can be played without a subscription to PlayStation®Plus. * Please click here for further details about Crysta. The 60 Day Game Time Cards are available at participating video game retailers throughout North America and serve as a payment option allowing players to add 60 days of game time at the Standard subscription rate, subject to account limits. 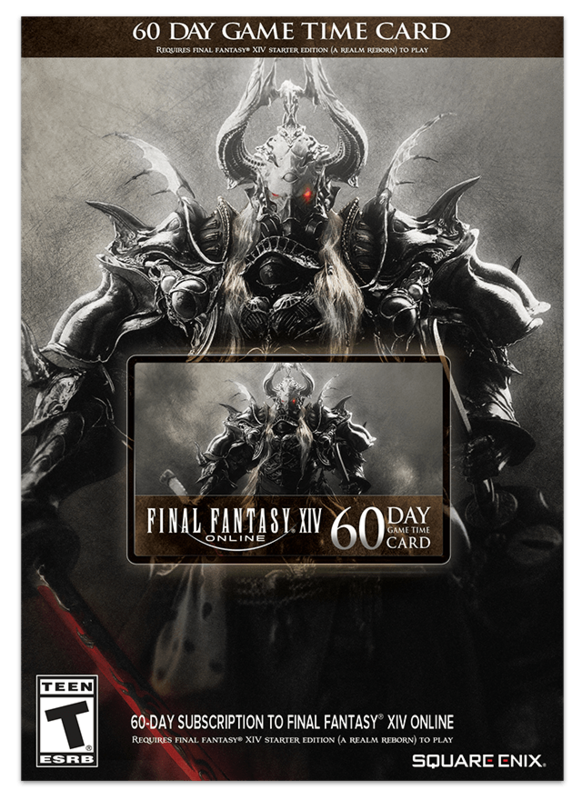 Sixty days of game time will be added to your account once you redeem the 20-digit PIN code found on the card itself or on the purchase receipt through Mog Station, the FINAL FANTASY XIV Account Management System. * Game Time Cards must be redeemed on Mog Station in order to receive the 60 days of game time. Customers who purchased the standard edition of A Realm Reborn, Heavensward, or Stormblood can receive the in-game items included with the collector's edition via a digital upgrade. * The physical items included with the collector's edition will not be granted by purchasing a digital upgrade. Review details of the A Realm Reborn Collector's Edition. Review details of the Heavensward Collector's Edition. Review details of the Stormblood Collector's Edition. The Collector's Edition digital upgrade can be purchased via the FINAL FANTASY XIV: Mog Station.